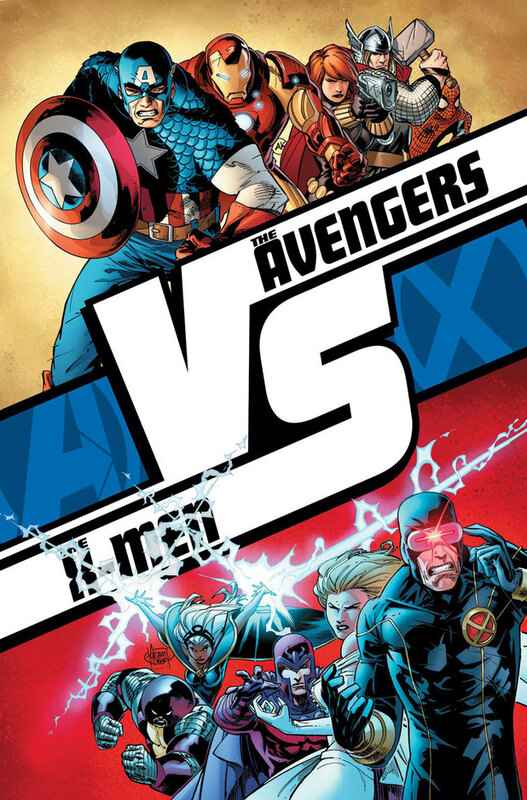 Following the announcement of Avengers vs X-Men, Marvel’s massive summer crossover was A vs X, a 6 issue mini-series designed to showcase some one on one fights between the Avengers and X-Men. Considering the sheer number of characters that have either been an X-man or an Avenger ( a shorter list would be who hasn’t been either), the possible fight combinations can not easily be calculated. It’s not necessarily a rarity to see two heroes fight one another though. In fact, if you consider the last six years, we’ve seen Civil War, pit hero vs hero in a battle of ideals. World War Hulk, pitted the Marvel Universe versus the Hulk and his allies. 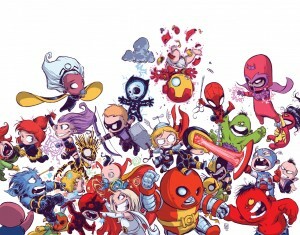 Fear Itself, where several heroes became part of the Worthy and ended up fighting their own friends. Schism, forced the X-men to choose which side of the future they were going to be on and now Avengers vs X-Men where Cyclops wasted no time in firing the first shot in the twelve issue epic on a trespassing Captain America. And, in a surprisingly intelligent decision by Marvel executives they decided to place some of those fights into their mini-series. This is in stark contrast to the fights in Fear Itself that pretty much called for readers to break from the story and grab another book if they really wanted to see what happened when Thor fought both Hulk and Thing. The fact that Fear Itself would stop in the middle of a fight and move into another scene was rather annoying, especially when the final page simply suggested you go grab another comic book. So kudos to Marvel for learning from their mistakes and in this years big event, devoting a book just to the fights and designing them in a way where you really don’t have to read them to keep up with the real story. And Marvel spared little in the first fight pitting two heavyweights, Iron Man and Magneto against one another. The initial story is penned by Jason Aaron and penciled by Adam Kubert (I’ll stop a moment here and thank his father Joe for his contribution to this great medium) and to the series detriment set a standard for what should have followed. Many of the fights that follow are rather bland in comparison, pitting characters who have little to do with the series against one another. But this fight is fun. 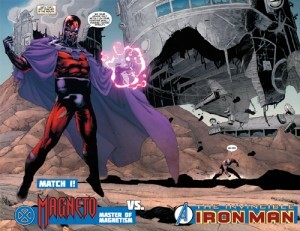 You have the Master of Magnetism taking on a man made of metal. A seemingly unfair fight that is balanced solely because of Tony Stark’s mental acumen. Arriving in a suit made from carbon nanobites we get an even fight right on the first page as the back and forth narration from the two brings the reader in. And then BAM! A two page spread with Magneto ready to drop a very large metal building on Iron Man and testing just how invincible he really is. From there we get seven more pages of a very entertaining and engaging fight that occasionally include an AvsX fun fact, an attempt by Marvel to add a little information and humor to an otherwise serious story. Your winner in the end was Iron Man. No cop out. Just two heavy weights going toe to toe and delivering in a clean finish. And even more important are Magneto’s last lines, weakened he says, “Find Wanda, you’re going to need my daughter.” Not only did we get a good fight, we get taken back to the real story in a scene that we didn’t need to read, but did enhance the story and was a great way to kick start this book. The second fight of the issue, penned by Kathryn Immonen and penciled by her husband and fellow Canadian Stuart Immonen opens with the Thing being clobbered by Red Hulk. AvsX Fun Fact: The impact of Namor’s punch is equal to the force of a car at 45 miles (52 for the Thing) per hour is thrown on in the page and works in conjunction with the uppercut being delivered by the ever arrogant Namor. The second fight of the series places two guys who have never really taken a liking to one another in a fight just off the coast of the X-Men’s home of Utopia. In contrast to the opening fight which was a lot of one-ups-man-ship in the tactical department; this is just a slug fest. Again we get a clear cut winner (though neither by knockout) and a little ending banter as Namor says, “I should have finished you off years ago,” followed by Thing thinking (since their fighting below the island) You couldn’t finish a book (an ironic statement since I doubt Mr. Grimm has ever opened one). Thing walking out of the water victorious is our closing scene and an excellent ending to the first issue. Where the first issue opened with two very entertaining, back and forth marquee match-ups, issue 2 throws out a curve ball opening with Captain America and Gambit. I’d like to mention at first glance this seemed completely random—but, it is alluded to in a few panels of Avengers vs X-Men #2. 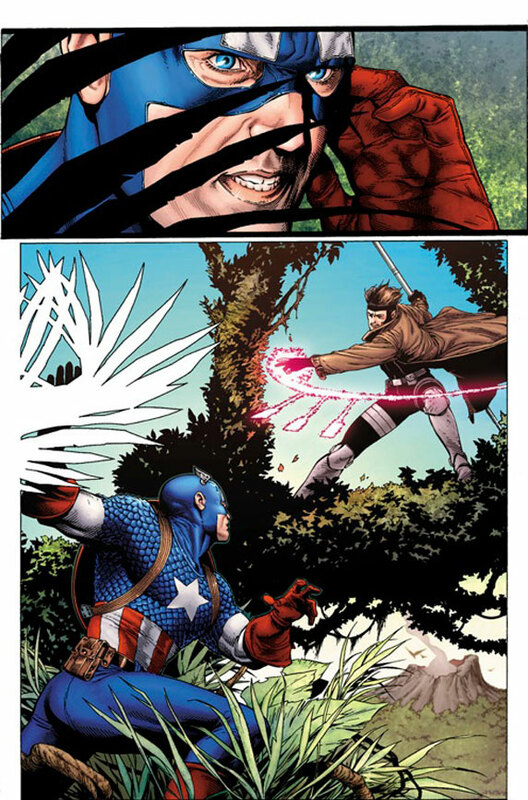 Gambit sneaks up on Captain America and then a page later we find that the captain has laid out the Cajun. Steve McNiven wrote and drew the story. Part of the problem with this fight is it’s not a believable contest. Gambit is in no way in the same league as Captain America. The opening pages of the fight have Captain America running around and dodging wile communicating with Tony Stark via ear communicator like he was fighting a small contingent of easily defeatable Hydra agents. Gambit essentially got in one trick shot, charging the star on the first Avengers chest. To which Cap replies to Gambit (who goes from smug to knowing he’s about to get hurt inside three panels), “Cute trick Gambit. You have my undivided attention now.” And then one good uppercut to the former Thieves’ Guild member and the Cajun went down for the count. A ten page story and Gambit was taken out with a single punch. Now, in defense of Marvel, there’s probably a very small list of people they would even allow to look good fighting the Avenger and Gambit would not be on that list. But that’s the problem with this fight in conjunction with the book. Avengers vs X-Men is designed to be (and I find myself using the term more often then I’d like) a summer blockbuster. The fight book isn’t allowed to be a dud just because it’s not the meat of the story. And this fight is. While McNiven’s art is a pleasure to look at, and the writing works (though the coloring provided by Morry Hoolowell is a little to plain for my tastes) the fight ends up feeling like filler. At the very least however it does feed back into the main story while providing a definitive winner via knockout. The forth fight in the series provided by Kieron Gillen and Salvador Larroca has Spider-Man face off against the Cyttorak empowered ( that would the gem and the demon responsible for Juggernaut) Colossus. Again, another curve ball. Now there isn’t anything wrong with a curve ball. Part of the problem with the X-Men is that few of its members have really ever been able to sustain a solo book so they often feel like C level characters on their own. Had these two fights happened before Magneto and Iron Man or even Thing and Namor they may have been acceptable, but I think following those two we end up with a bit of a downer. But hey, “David versus Goliath,” is an easy sell, and in reality, a supped up Colossus should give the web-head some problems. In terms of the fight it’s a bit of a squash match. Minus some quips from Parker and some early webbing, Colossus owns him. Which is the beauty about writing Spider-Man—he’s actually allowed to look bad in a fight and still come out the real winner because the guy never gives up (see the spectacular Avengers vs X-Men Issue 9 for more proof of that). So the X-Men are actually allowed to get one on the board here (3-1). But, as with the case of the Captain America and Gambit where the writing and art work, the combination of fighters leaves something to be desired. Again, perhaps it’s because of the conjunction of these two fights in comparison with the first issue. If this was Wrestlemania Iron Man versus Magneto could close the show. Namor versus Thing, a classic grudge match could easily be in the upper card. But Gambit versus Captain America would be a seventeen-second let down and Colossus versus Spider-man would end up being an afterthought trapped in the middle of the card with fans waiting for big match ups. Now, while Colossus is not a huge name, issue 3 opens up with the type of fight this series should have always aimed for. Jeph Loeb and Ed McGuinness pit The Thing and Colossus in a battle on the Blue Area of the Moon. (Note: this area of the moon is the only place on the moon where oxygen exists. AvsX Fun Fact). The actual story starts with Jeph Loebs man-crush Red Hulk squaring off with the metallic X-Man but quickly turns into Thing versus Colossus following an ax handle swing. While I do think Thing versus Colossus (or even Red Hulk) should have been what this series should have aimed for in its pairing I did feel disappointed. Assuming they stick with two ten page fights per issues ( and honestly not only is 20 pages for $4 a rip off but ten pages to develop a fight in a book all about fighting is rather quick) I would like to see different characters in each fight. I’ve already seen Colossus and Thing fight in this book. The fight itself is a good little tussle accompanied by some okay dialogue (sorry Jeph, “Don’t they say “Stay Down!” in Russian on the ninth panel of the fight didn’t digest well). I do enjoy the struggle of Colossus to control the power he now harnesses. His self-aware narration, “Outside the Blue Area of the moon he needs air. While I no longer need anything,” makes him an interesting character to me as I recall his background as a peaceful painter. Even so far as he comes up the victor while questioning if he’s really lost having given himself over to Cyttorak. I’m not really a big fan of McGuinness. The muscles on top of muscles thing doesn’t work for me. I guess I specifically take issue with having seen a picture of Superman and Batman back to back and they’re both built like the Hulk. But this fight was perfect for him. He just got to draw two big old bruisers duke it out. And in that he delivered. And Loeb, while my interest in him has waned tremendously post Batman: Hush, put together a good fight. There was some questionable dialogue. But the narrative by Colossus made this a fight that not only exists inside of the Avengers vs X-Men story, but makes it a character driven moment as opposed to solely a story driven fight. However, following a very solid fight between the two hardened heroes we head back into random territory when Magik and Black Widow tighten up their fists and throw down. I suppose they were shooting for Russian Spy versus Russian who spends too much time in a hellish limbo. A little lop sided in the power department though and another let down. 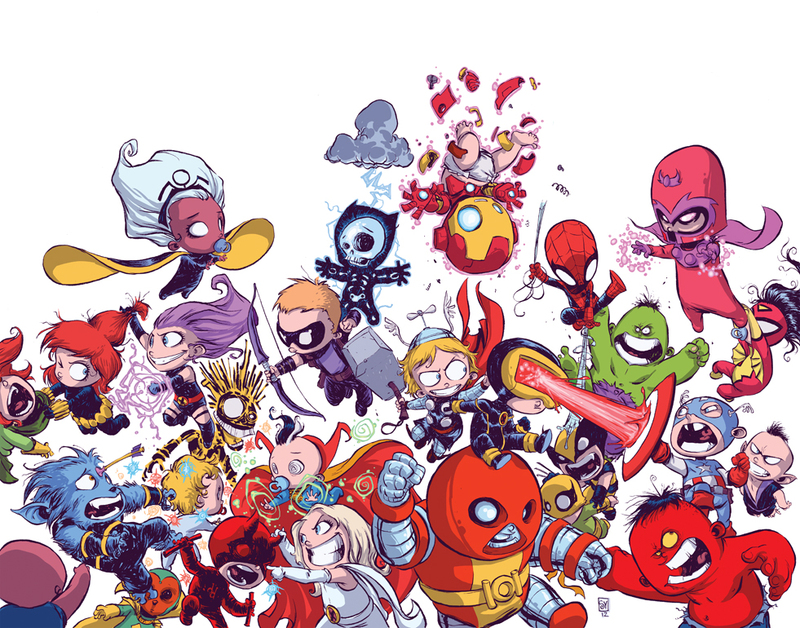 I was looking forward to seeing Psylocke and Black Widow tangle from the early promotional artwork (would have loved to see Leinil Yu on that fight) or Magik versus Doctor Strange. It would have been interesting to see what went on in that fight that occurs in Avengers vs X-men, but doesn’t actually happen. The fight itself by Chris Yost, who is a rather underutilized talent and Terry Dodson is an entertaining fight. They do a very good job of making Black Widow seem like a possible threat because of her background and experience. The early hand to hand combat is easily in the Russian spy’s favor, and even when Magik utilizes her ability to create warp portals into Limbo, Black Widow uses her experience to drag Magik along with her. And even in Limbo where Magik has the clear advantage, Widow kept her cool and actually came out on the better exchange of the conflict when she pulled a gun to Magik’s head. However, despite getting knocked around quite a bit, Magik got to show while she is not the better fighter, she is still far more powerful as she pulled out her soul sword (AvX Grim Fact: Magik’s soul sword is a manifestation of her life force and is lethal to magical beings. But has been known to render non-magical entities unconscious) And she ends up the winner. Scorecard is Avengers 3 X-Men 3. In terms of set up, issue 4 is a successes. In the previous 3 issues I questioned the order in which the fights occur. But in issue 4 we open with Psylocke chasing after Daredevil in a a solid fight from Rick Remender (who has put together an awesome run on Uncanny X-Force) and Brandon Peterson. On a personal note Daredevil has been my favorite superhero for a while now. And behind Wolverine and Nightcralwer, Psylocke is my favorite X-Man. So needless to say, whereas in the other fights I tended to side with the X-Men I was a little torn. Remender did an excellent job of making these two equals, negating Psylocke’s telepathy early on as she was just completely overwhelmed with the hyper-senses of Matt Murdock. Good back and forth action as they test one another early on. Coincidentally the end comes following a few moral dilemmas. Daredevil, having believed he kicked Psylocke in an unintended way watched her fall off the building they fought above only to save her as they both crashed through a window. Psylocke however uses this to her advantage and takes the lawyer down and places a psychic knife (as Chris Claremont would say the totality of her telepathic powers). Daredevil then translates her anger to her and left her with a question that froze her long enough to escape. “If this ambush in any indication…you’ll have us on an island of our own before this is all over. Have a lot to think about it seems. Before you get up and chase me you might want to ask yourself one question. What do you really want?” The fight ends in a draw which I can live with. In terms of fighting ability they are evenly matched and even in terms of ability Remember does a good job of balancing them out against one another. The story also plays up to some of what Rick is doing with Psylocke in Uncanny X-Force as she really tries to figure out where her own morality lies. And in a way, Murdock layered himself out of this situation leaving the jury with question to ponder while he exited the spotlight and left it on her to decide what to do. I’ll take a moment to recommend the Psylocke min-series by Christopher Yost. Very good read. As far as the art goes…well can I get some more Brandon Peterson. I mentioned setups for these fights and that is where I think Issue 4 really succeeds. In the first issue, while it was important to kick off with a big fight, Magneto versus Iron Man was the bigger match up and should have ended the book. And then in issue 2, neither of those fights should have happened following the first book. It was unfair and helped in the let down. Issue three, Colossus versus Thing was easily the better and even more prolific fight and should have closed the book. But here we opened with two characters who not only have a small role in Avengers vs X-Men but are not super stars. 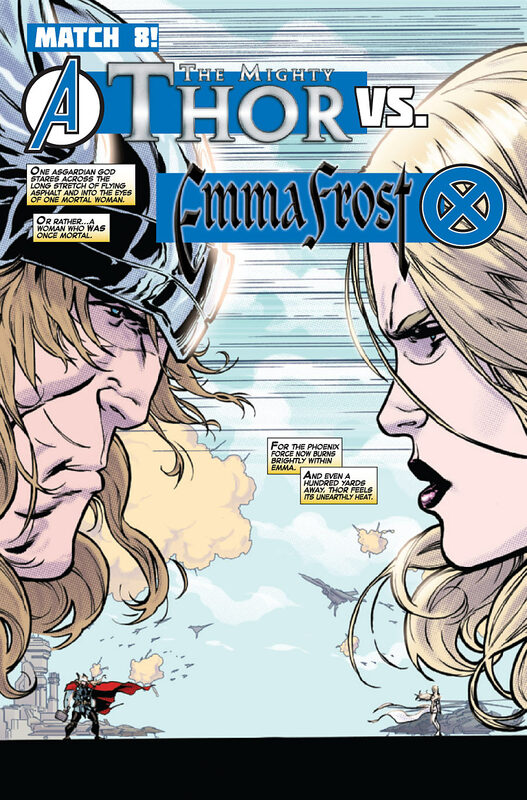 Emma Frost and Thor however, are very big names in their respective ends of the Marvel Universe. Kaare Andrews provided both the story and art for this one. I can’t say I’m familiar with his work but again, we have a good display of power. The writing itself is engaging. I liked the narration stemming from an omnipotent source as opposed to the characters themselves. I think, especially in comparison to the other fights, it allowed the focus to be on two very powerful beings duel one another instead of a grudge fight or anything else of that nature. And while I’m not very drawn in by the artwork, the splash on page 6 of the fight is a great image. 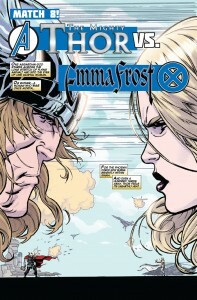 Thor uppercuts a diamond formed Emma Frost and she shattered like she was a victim of a Sub-Zero fatality. However, thanks to being empowered as one of the Phoenix 5, Emma gathers herself back together and then proceeds to beat the thunder god until he’s unconscious. The artwork again isn’t really for me, but I enjoyed the set-up of this issue as both fights played off of one another well and made this issue an overall pick me up. Heading into the penultimate chapter of the fight book we get a fight from Leinil Yu, most known for his depiction of Wolverine and all-star writer Matt Fraction. However, despite the imagery it evokes, I feel like, especially going into the fifth issue that the pairing is a bit of a letdown. Hawkeye vs Angel makes sense if you’re pinning names on a board and looking for interesting match ups. You have a guy who flies taking on a guy whose pretty good with a bow and arrow. As with so many instances of this series the fight itself is engaging. I just question whether they could have really tried to go for the fences more instead of settling for grounders in this series. I’m also slightly confused by why this didn’t become a two on one fight since Psylocke showed up (this could have been a really good Black Widow/Hawkeye vs Angel/Psylocke deal). This is a war. Considering Hawkeye has no problem ending the fight with an arrow to Warren’s Abdomen I can’t wrap my head around Psylocke being so passive. The fight that closes this issue however actually steps back a bit and evolves a piece that began in the main book—that is the desolation of Storm and Black Panther’s marriage. Honestly, their marriage always seemed a bit arbitrary to me. I guess in part because I never followed the Panther, and I never saw him show up in the X-books I kept up with. So their marriage never felt organic. 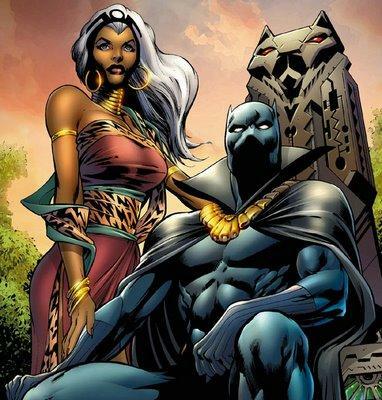 Though her appearance in Black Panther—The Man Without Fear made me see them as a believable couple. Jason Aaron—who is making a very quick name for himself and Tim Raney put together a very good story where the fight and even the actual Avengers vs X-Men story is an afterthought. Even though what these two characters are fighting about has to do with their decisions in the story, it’s very much just a story about a married couple who have found out that their not as compatible as they believed. The narration is rather beautiful as both consider the other. Storm sees T’Challa as to cold. Panther sees Storm as too hot-blooded. He thinks she was never going to be happy here. She believes she could have been. He thinks thanks God we never had children. And she thinks maybe it could have changed things between them for the better. All of this leads to a full page embrace between the two that is done in such great fashion by Tom that you believe these two can be bigger than their differences. But then she sucker punches him, takes off her ring and flies away. Now, the final lines of this issue almost kills this story: “Winner? There are no winners here,” is just too cheesy and a bad attempt to keep in line with the Winner portion that occurs at the end of each of the previous fights. This issue’s last page should have simply been the 3 panels used, one with T’Challa walking sadly away and the next with Storm flying away clearly bothered and then the closing image of a ring in the dirt. The final issue of the series came with an interesting decision. I’ve read some online criticism about the entire story feeling too long. So I imagine by this point the creatives at Marvel were rather exhausted. Which is why I think they decided to have a little more fun with this issue. The opening fight sees Hope and Scarlet Witch have at it in a duel that is just as much about the actual action as the blaming of why all of this is happening. Kieron Gillen takes up writing duties while Jim Cheung does an excellent job with the artwork. The fight itself is very well done. Both mutants had an upper hand at various points and we see how youth and experience can compete with one another. Hope mimicked Wanda’s power and got a little creative with it. Wanda however maintained her focus and the two had a battle that could have went more than ten pages if not for the fact that at this point in the story the fight was to blow off some steam. Captain America and Ironman sort of break the fight up and the two stare at one another for a moment. And then this is when Marvel decides they’ve crossed the finish line, screw it lets celebrate. Hope sucker punches Scarlet Witch and knocks her out. The final panel is just Hope with her hands raised and Ironman shaking his head while Captain America stares on in the same sort of disbelief some boxing fans had when Floyd Mayweather took a cheap shot on Victor Ortiz (never let your guard down when standing across from a guy with his fists raised). And the second half of the issue was mostly single page funny bits. Domino standing over a defeated Red Hulk. A few other bits. But the real winner is the first page, which should have closed the book out. Cyclops versus Captain America in a verbal fight is a great read. Just lots of funny stuff that. Every page is done by different pairings and while I would have liked to have seen a good fight, it was far to difficult a decision to make on who should have fought in that last slot. This was a fun compromise. Final score by the way: Avengers—4. X-Men—5 with 2 draws. Call this one for Marvel’s Mighty Mutants. Overall, this has been a very fun series, even in its disappointments. I can’t say it makes me a believer that A + X, Marvel’s follow up to this mini-series following the end of Avengers vs X-Men in their Marvel Now! Promotion. One of the flaws in the series includes the order the fight were presented. If you’re a true wrestling fan, you understand how the order the card affects how you feel about certain matches. You don’t need to try to one up yourself with every match, but you do have to know how to close segments. The other issue is a financial one. And it’ something that at this point in time people have just accepted. But paying $4 for a twenty page book is just wrong. Now it’s only a dollar, but it’s principle. And leading into A + X, I’m not sure I’m willing to drop $4 on 2 ten page stories that likely won’t have time to develop. Ten pages for a one on one fight often seemed like it was too quick. Ten pages teaming up two characters worries me. I’m also not a fan of seeing a character have a repeat performance in this series. There are a lot of characters that could have been utilized. In a six issue mini-series, considering the number of individuals involved I just have to believe some bigger match ups were in their somewhere. If you consider the big the 3, Iron Man, Thor and Captain America they fought Magneto, Emma Frost and Gambit respectively. Gambit is hardly in the upper echelon of the X-Universe—fan favorite, yes. But he is not the X-Men’s equivalent of the big 3. And in part, I think this is because Marvel was afraid to pull the trigger on those big match ups and having to write themselves out of a corner. And then also in part because the X-Men are known so much more for working together it’s harder to pin down a big 3 to match up. But, those things do not make this a bad series by any means. Far from it. I’ve enjoyed it. Even when I’ve been let down by the match ups I’ve at least enjoyed the fights. And the series gives me hope. It seems that Marvel may have actually listened to readers complaints about Fear Itself. I was never more annoyed then getting to a page that tells me go back to the comic book store and pick up Fantastic Four if you want to see what happens in the Hulk/Thing vs Thor fight. Or go pick up Fear Itself Spider-Man so you can see what happens when Parker leaves the fight to check up on the people he cares about. This series was an add on and not a necessity. There are plenty of complaints about too many tie ins, but Avengers did a great job of not making it mandated reading to get the whole story. You can enjoy this book all on its own and more importantly, you can read all 12 issues of Avengers vs X-Men without ever having to read these six issues. As a reader, I appreciate that, and it’s part of the reason I bought every tie in issue to this series ( except for Secret Avengers). I wanted to support the option of following tie ins. Another highlight was the talent involved. Sometimes it seems these big events become too big and the talent ends up being watered down in order to stay on schedule. No offense to some who are involved, but I expect the best of the best involved in writing and penciling duties of the big events and that includes the tie-ins. This mini-series featured the likes of Matt Fraction, Jason Aaron, Jeph Loeb Rick Remender with artwork from Salvador Larroca, Adam Kubert, Steve McNiven and Ed McGuinness. Part of what we look for in a series like this is name value, and Marvel brought that while also getting some of the up and comers like Chris Yost some exposure. Now with A vengers vs X-Men wrapped up we can begin to look back at the series. And as I reread the fight book I found a flawed series of stories that I actually enjoyed. I can remember talking about theses issues and my initial thought was always feeling let down beyond the first issue. But having reread them, I’ve come to really love the Storm versus Black Panther story. It’s a rather depressing tale, but one that I think see often in the real world. 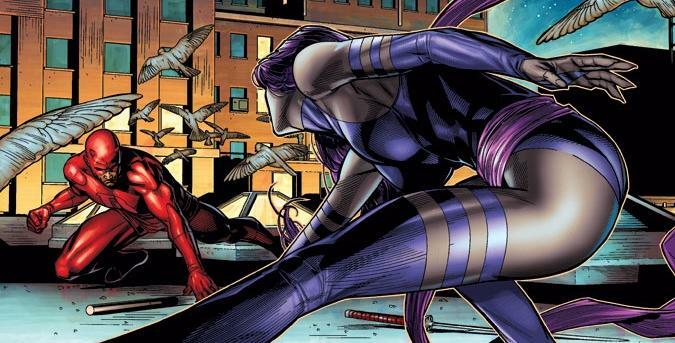 Daredevil versus Psylocke was an excellent fight despite neither really being a part of the main story. And in threw in some questions about morality. And hey, Colossus took down Thing and Spiderman which has to give him some momentum as he teams up with Cable in X-Force. Could it have been better? Yeah. But did I still enjoy it? Yeah. And I think we lose sight of that sometimes. A book can be flawed and still be enjoyable. It is however on Marvel to learn from their flaws and put an even better book out on the next go around. With that, we’ll see soon enough if Marvel NOW! 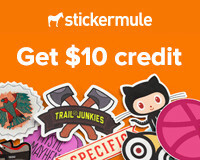 Is just a tag line, or a real effort to step it up.